If you’ve encountered problems when it comes to your worm’s bin (particularly if you’re raising red worms or raising European nightcrawlers), then you can be assured that there are common problems and solutions in worm breeding that you can learn and rely on. You may encounter some symptoms, so it’s best to know how to deal with these by knowing what caused the particular problem; and then have these solved at the best possible way. While you’re breeding composting worms (either red wiggler worms or european nightcrawlers), have you ever experienced them crawl out of the bin? Chances are, your worms may be starting to get sick, slowly dying, or starting to attract unwanted pests into the composter. A harsh environment may lead to your worms eventual demise, so know how to care for them the right way. Your worms breathe through their moist skin so you definitely can’t leave your worm composting bin too dry, too wet or too acidic. Leaving the bin too dry will post harmful to your worms, and will eventually lead to their death. Leaving the bin too wet on the other hand can lead to your worms drowning from this. So try to achieve a bedding that has the consistency of a wrung-out sponge. Apart form that, you can’t also leave your worms in a very acidic bin, as they can burn from this. When you’re raising worms, you should also know that you can’t overfeed them nor underfeed them. It’s best that you feed them enough. Now if they happen to ignore much of the food inside the bin, then this can lead to leftover food, which can then lead to unwanted pest visits (a liking for fruit flies in particular). This goes the same with feeding them organic wastes that are bad for them (spoilt food can also cause odor build-up). One good thing that you can do to eliminate odors and pest visits is to bury their food with bedding materials. Avoid feeding them foodstuff that are spicy, salty, oily, citrusy, or anything that has dairy, meat, seafood, or poultry in them. You should also know the right and wrong kinds of food to feed your red wigglers and/or nightcrawlers. Raw or decomposing organic materials (can be obtained from your kitchen or garden) can be given to them just as long as these are: Vegetable or fruits peels, crushed egg shells (also helps balance the pH level inside the worm bin), coffee grounds, used tea bags, grass clippings, strips of newspaper or cardboard, dried leaves, and animal manure (only the ones from plant-eating animals). You also shouldn’t bother them. Red worms or nightcrawlers like to be untouched, especially when they’re busy doing their everyday things. They also like being in dark surroundings, as they can be very sensitive to bright lights. You can only open their bin when it’s time to replenish the bin of new food and bedding, and when harvesting their castings. When it comes to common problems and solutions in worm breeding, also take note that worms need a bin with holes (regularly check if there are any blockage), so that air can freely flow in and out of it (worms also need oxygen to be able to live). Much like their need for warmth as well (room temperature in anywhere that they are located in is ideal). If you want to get a hold of the lowest-priced Can-O-Worms on the internet, then you’ve come to the right place! Our quick, odorless, and space-efficient stackable composter can help breakdown regularly generated wastes from your kitchen and garden. Get your own ‘Black Gold’ produce in just a matter of time. Get yours today, and experience a better vermicomposting process! To know more about the product, check the Can-O-Worms here. • Your worms breathe through their moist skin so you definitely can’t leave your worm composting bin too dry, too wet or too acidic. Leaving the bin too dry will post harmful to your worms, and will eventually lead to their death. Leaving the bin too wet on the other hand can lead to your worms drowning from this. So try to achieve a bedding that has the consistency of a wrung-out sponge. Apart form that, you can’t also leave your worms in a very acidic bin, as they can burn from this. • When you’re raising worms, you should also know that you can’t overfeed them nor underfeed them. It’s best that you feed them enough. Now if they happen to ignore much of the food inside the bin, then this can lead to leftover food, which can then lead to unwanted pest visits (a liking for fruit flies in particular). This goes the same with feeding them organic wastes that are bad for them (spoilt food can also cause odor build-up). One good thing that you can do to eliminate odors and pest visits is to bury their food with bedding materials. o Avoid feeding them foodstuff that are spicy, salty, oily, citrusy, or anything that has dairy, meat, seafood, or poultry in them. o Vegetable or fruits peels, crushed egg shells (also helps balance the pH level inside the worm bin), coffee grounds, used tea bags, grass clippings, strips of newspaper or cardboard, dried leaves, and animal manure (only the ones from plant-eating animals). • You also shouldn’t bother them. Red worms or nightcrawlers like to be untouched, especially when they’re busy doing their everyday things. They also like being in dark surroundings, as they can be very sensitive to bright lights. You can only open their bin when it’s time to replenish the bin of new food and bedding, and when harvesting their castings. You do not want to make a mess when you raise your Red Worms, do you? So to make things easier for you, you should then be geared with all the knowledge that you need in order to effectively increase the number of your worms (which by the way can be used as fishing baits and composting worms). First thing that you have to consider is the worm bin. You can buy commercial worm bins or you can do it on your own. It is important that you drill holes in the lid, at the bottom and at the side of the container to allow air inside. Also, see to it that the container that you’ll use is not transparent. When it comes to bedding, have your newspapers and magazines cut into strips then soak them into water. It’s your responsibility to maintain the acidity level (6.5 PH) inside the bin and a temperature of 50-85 degrees Fahrenheit. Red Worms neither love to dwell in dry nor soggy places. The Red Worms’ diet is as important as their home. If one is defective, you may not have the best result. You actually won’t encounter much problem with their foods. Red Worms are heavy feeders of organic materials so even your kitchen scraps, grass cuttings, coffee grounds and tea bags will do. Just make sure that you do not feed them with dairy products, fish, meat, fresh manure and bones. Acidic fruits like citrus are also not good. If you give them grass clippings, see to it that those were not previously sprayed with chemicals. With kitchen scraps, avoid giving them oily foods. There it goes: the home, acidity level, temperature and the diet thing. 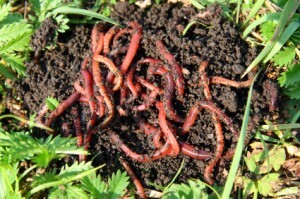 If all are carefully executed and maintained, you are sure to have healthy Red Worms!